Essentially there are two main divisions to color: RGB and CMYK. Pantone is an ultra-specific color guide that spans both RGB and CMYK. RGB is an acronym for Red, Green, and Blue. This particular color profile is meant for the digital spectrum (TVs, computer monitors, etc.) since each color is a wavelength of light. All three wavelengths have 256 depths, starting at 0 and ending at 255. When combined these depths allow for 16 million color possibilities. Crazy, right? To get a color, you simply pick the intensity for each wavelength. For example, white in RGB is written as 255, 255, 255, meaning Red depth is 255, Green depth is 255, and Blue depth is 255. On the other end of the spectrum, black is 0, 0, 0, meaning there’s a complete lack of light. It’s important to note that even though we design our projects in CMYK, you are viewing them on an RGB based screen. Thus, the colors will always be slightly different than what your screen shows. More importantly, the colors will display differently depending on how your screen is calibrated. RGB appears differently on a screen versus in print because it is a light based color profile. Where RGB is a color profile based on light, CMYK is based on ink combinations. It stands for Cyan (blue), Magenta, Yellow, and Key (black). In the print world, CMYK can be referred to as full-color printing or 4-color process. CMYK starts with a base of pure white, unlike RGB, which starts with a black base. Colors are then produced by adding different values of cyan, magenta, yellow, and black. Thus when you write out the combination for white in CMYK, it’s written as 0%, 0%, 0%, 0%. Meaning there is no percentage of Cyan, Magenta, Yellow, or Black covering the print surface. Just like screens all show RGB colors a bit differently, printers print CMYK colors different. At our shop, we have solvent, latex, and UV printers. All three print the same color profile differently than the other. It’s not a drastic difference, but it is different. While RGB is an additive color profile, CMYK is subtractive. In super-sciencey terms, this means the printed color subtracts or reduces the amount of light reflected from the print surface. As if RGB and CMYK aren’t confusing enough, we’re going to throw in Pantone colors. Pantone is a system of standardization for colors that bridges all color profiles. Each Pantone color has a CMYK and RGB standard so that the color is the same regardless of whether it’s being printed or viewed on a screen. Pantone’s catalog has over 1,400 colors. Pantone colors are written as PMS, followed by a color number, and then a C, U, or M. C stands for Coated, U for uncoated, and M for matte. This refers to the print surface. You can usually get pretty close to a PMS color when printing in CMYK, but for companies that are sticklers for exact branding, PMS colors are the way to go. Having a PMS spec ensures consistency in your branding no matter where you go or what product’s being made. It is also worth noting that requesting PMS colors often means additional surcharges on your order. All three color modes have their own purposes. If it’s digitally printed, it’s CMYK. If it’s on a screen (computer monitor, TV, phone, etc.) it’s RGB. If it’s screen printed, it’s PMS. PMS colors are the most specific color profiles, and useful for ensuring consistent branding. Your proof on a screen will always look slightly different than the finished product because it’s in a different color profile. Everyone loves to say that holidays are the most wonderful time of the year, but with all the hustle and bustle it’s not uncommon for disaster to strike. 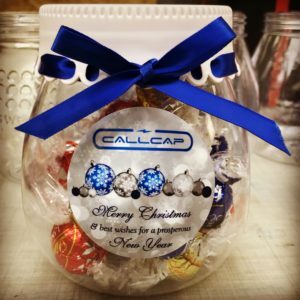 Last month one of our clients, Callcap, contacted us looking for custom Christmas goodies to send to several of their major clients. With access to thousands of products here, we were happy to help. Typically when someone reaches out to us for customized products, we create a presentation with a handful of options best fitting their needs. This is what we did for Callcap. They picked a cute mason jar filled with brownie brittle and adorned with a beautiful bow and decal, and we ordered the product. A few days after placing our order, the vendor called with terrible news— they were out of Christmas goodies until 12/22. Thus making our pre-Christmas deadline unfeasible. Don’t get us started on how a food vendor runs out of food. We’re still not sure how that happens. We pride ourselves on being good problem solvers, so we quickly got to work looking for alternative products. No luck. Either our vendors couldn’t meet the deadline or their costs were astronomical. It seemed the only solution would be for us to do the jars ourselves. We’d find the jars, fill them with goodies, put decals on them, and then figure out how to tie a proper bow. But what kind of story would this be if disaster didn’t strike again? So, we ran into another dilemma. Michaels was out of stock of the plastic mason jars we wanted, and it seemed like nobody in town or online stocked them. The search for the perfect jar didn’t take too long. Walmart offered a cute jar that allowed a ribbon to be laced through the lid. Knowing our luck at that point, we quickly purchased all the jars we needed for the project. Since we had deviated so much from the product our client originally wanted, we felt it best to put together a sample product before creating a bulk batch of them. Normally our vendor would send us a photo sample before we approved the order. If you’re ever ordering custom products, it’s good practice to request at least a virtual proof. Luckily Callcap was pleased with the product and we were able to move forward. Once the jars were finished, bows and all, we boxed them up individually and shipped them out to Callcap’s clients. At the end of the day, we were quite happy with the results. Check it out. The most difficult part of this project might have been learning how to tie a proper bow. It took LOTS of practice to get it right. Sometimes you’re just going to have a project that seems to be one disaster after another. But we firmly believe that with a little ingenuity and a lot of hard work, you can always find a solution. To browse our promotional products, click here. You can also request a quote here. In the graphics world, there are two main file types— raster and vector. When customers come to us with their signage needs we always request vector graphics. Here’s why. One example of a raster graphic is a photograph. Raster images are made from tons of tiny squares (pixels) that have individual color codes to create a photo. The more pixels per inch, the higher quality and resolution a photo will be. While it’s better to have more PPI (pixels per inch), it also makes file sizes ginormous. Think about it. If you have an 8’ x 4’ banner being created at 300 PPI, that’s 1,382,400 individual pieces of information. This makes it difficult to send large files, and it takes forever to open them. Another downside to raster graphics is that once you’ve got them saved at a certain size and resolution (8’x 4’ at 300 PPI), if you try to drastically resize the graphics it will affect the image’s resolution. On the flipside, vector images are created from sets of lines and curves. These have mathematical values so that vector art can be resized without affecting image resolution. Vector graphics are typically fonts and logos. Because vector graphics are sets of mathematical values, their file sizes are much smaller. Thus making these files easier to send. Using the Mac Apple Logo as an example, the middle version is a vector logo. This one is comprised of lines with nodes and uses a mathematical formula for scaling. It gives the logo a more crisp appearance. The Apple on the far right is a raster image. Since it’s comprised of square pixels, it has a rougher edge and cannot be scaled without further reducing resolution. The major issue encountered with vector graphics is compatibility. Vector art can be saved as a PDF so that it can be opened on a computer without design software, but to edit a vector file you need programs like Adobe Illustrator. A more frequent issue we encounter at our shop is someone resaving a raster image in a vector file format. This does not mean the file is suddenly a vector image capable of being resized without issue. Stay tuned for an upcoming post expanding on why this won’t work. If you need to have any kind of signage made and do not have vector graphics, we staff two graphic designers that are able to re-create most graphics in vector form. There is a fee for this service, and it’s based upon the time it takes to redo the art. As detailed in this article, raster and vector graphics have their respective uses. There are pros and cons to both file formats, but vector is usually preferred when it comes to creating signage. It’s that time of year again! Below are the dates we’ll be closed this holiday season. Aside from these days, we’ll maintain regular business hours (Monday through Friday, 8am-5pm). Looking for customized holiday gifts for your employees and/or clients? Give us a call at (316) 264-7446 or check out our promotional products here. A few weeks ago we attended our seventh Exposure! New attendees and exhibitors often ask us if we find the experience valuable, and we always answer with a resounding “YES!” Though we don’t always come back to the office at the end of the day with a ton of new leads, we usually make several connections that end up working out in our favor later on down the road. It’s all about the long game right? We’d like to congratulate our winner, Jose Gonzalez. Jose is the owner of Artistic Polish and Design, a local business that specializes in decorative concrete and flooring. Their primary focus includes polished concrete, epoxy flooring, and concrete counter tops. You too can have one of these awesome frames! We have a special running for our remaining stock at $295. This includes a full color print inside. Normally they run $420. They also come in a smaller size (16×10) for $195. The sky is the limit for your photos, and it’s incredibly easy to change them out. You just slide out the old one and drop a new one in. These frames make popular gifts, especially for car and sports fanatics. If you’re interested in more information regarding this product, you can contact us here. We usually respond to quote requests within 24 hours. With the holidays fast approaching, don’t forget to reach out about our custom promo products as well. With access to thousands of fantastic products that make for great employee and/or client holiday gifts, we’ll gladly put together a presentation including several items that might interest you. If you prefer to research ideas on your own, you can access our promo product database here. Once you’ve found any options that stand out, send us an email to confirm product pricing. Every so often we have client call in with a tall order. Quite literally in this case. 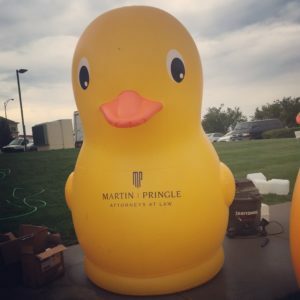 Our friends over at Lifeboat Creative contacted us to ask about putting decals on 6’ tall rubber duckies that would be floating on the pond over at Bradley Fair during the Autumn & Art Festival. We were happy to help with the project. No lie, it’s mostly because we were excited to see a 6’ rubber ducky in person! After all the details were hashed out and the install arranged, we were struck with doom and despair. On the day of our outdoor install, Mother Nature decided a rainy day was in order. Hoping to find a dry spot where they could complete the job, our guys headed across town. Luckily the rain had subsided by the time they arrived. Once the duckies were inflated and the decals installed, we got our pictures and watched as they were released into the wild (more accurately, as they were shoved into the pond). Another reason we enjoyed assisting with this project is because it was an out-of-the-box idea. We always strive to try and meet clients’ requests. Do you have a random idea that would make for a really interesting project? Let us know! You can contact us here or email sales@signsdesignwichita.com. We usually get back to quote requests within 24 hours. Are you one of the many businesses participating in Wichita Business Exposure? If yes, we’re offering a special discount for all confirmed vendors! Discount does not include design/art charges or install where applicable. We create and sell a variety of items particular to trade shows and expos, including custom tents, feather banners, printed tablecloths, and promotional products. Pens, cups, and reusable bags seem to be go-to items for events such as this, but our inventory offers much, much more. Take a look at our promotional products here. Don’t have the time to research what you’re looking for? Let us know. We’re always available to put together a promo product presentation or review signage options with you. You can contact us here or email us at ariel@signsdesignwichita.com. Please don’t hesitate to stop by and say hello throughout the day. We’ll be in the same booth as last year, #211. 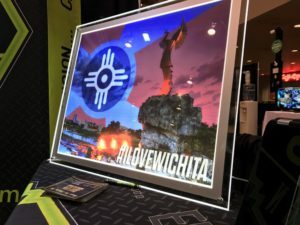 Leave your business card with us to enter our drawing for a free, backlit frame with a custom with a Wichita Flag graphic. Hope to see you there! Join us at Exposure 2017! Wichita Business Exposure, one of the area’s largest networking events is being held on September 28th, 10am-5pm, inside Century II. With hundreds of exhibitors and more than 1000 attendees, the event continues to grow every year. 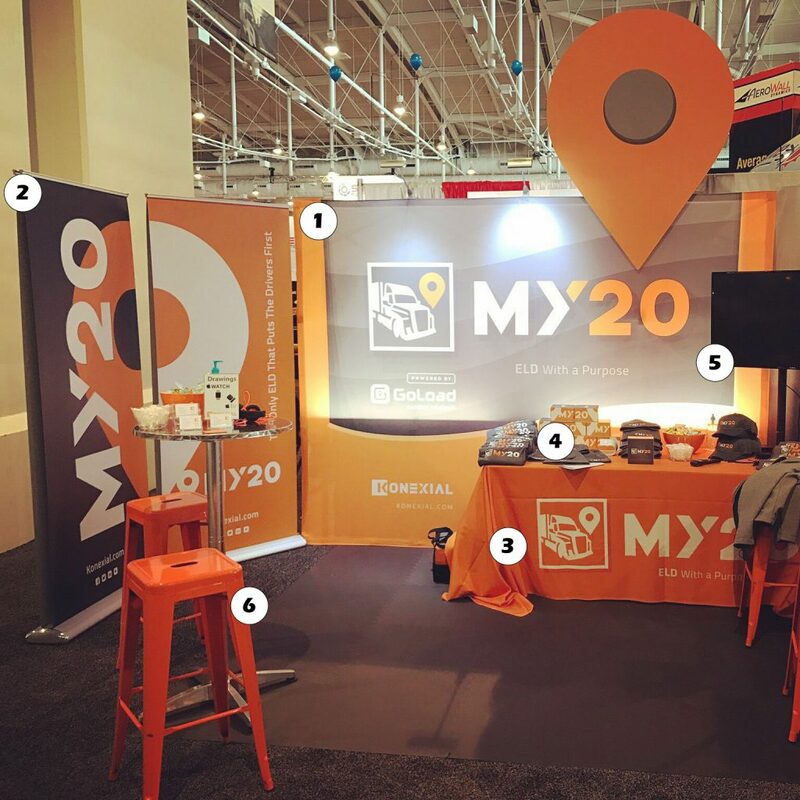 We offer a variety of items particular to trade shows and expos, including custom tents, feather banners, printed tablecloths, and promotional products. Pens, cups, and reusable bags seem to be go-to items for events such as this, but our inventory offers much, much more. Take a look at our promotional products here. See something you’re interested in? Let us know! Not finding what you’re looking for? Call us and we’ll put together a presentation of options for you. Please don’t hesitate to stop by and say hello throughout the day. We’ll be in the same booth as last year, #211. 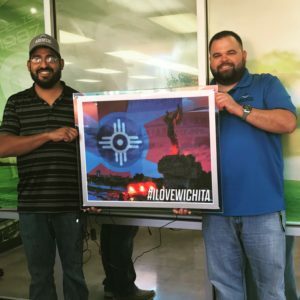 Leave your business card with us to enter our drawing for a free, backlit frame with custom Wichita flag print. Hope to see you there! Today marks the 147th birthday of our lovely city, Wichita. 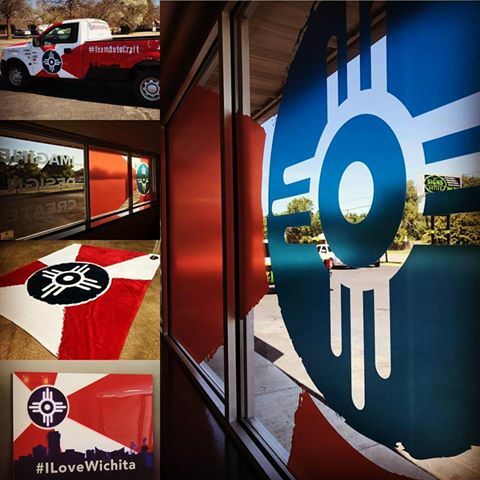 To celebrate, we’re taking a look at recent jobs we did featuring the Wichita Flag. Check it out! Starting with the truck: (1) Wichita Flag truck done for Auto Craft/Wichita Chamber, (2) etch installed on the front of our building, (3) backlit sign created and installed in the Wichita Chamber office, (4) velveteen plush giveaway blanket, and (5) second shot of the printed etch installed on our storefront. The Wichita Flag truck was a fun project! When the Wichita Chamber and Auto Craft approached us about their idea, we were definitely excited! We enjoyed this particular job because it pushed us creatively, allowed us to build our full-wrap portfolio, and quite honestly, we love the bragging rights we got when the job was done. Who doesn’t want to say they’re responsible for the first Wichita Flag vehicle? The backlit sign. Wow. Talk about a challenging, but incredibly fun, job! We’ve done some backlit signage in the past, but we built this one totally from scratch. I’d get into all the technical mumbo jumbo, but even I don’t understand it. Luckily we have a team of installers with a very particular set of skills…skills they have acquired over a very long career (Okay. I’ll stop with the Liam Neeson references, but you can’t tell me you didn’t start reading that in his voice!). When I pulled our Wichita Flag blanket out of the box, all I could think of was the little girl from Despicable Me screaming “It’s soo fluffy!”. This blanket is so soft. That’s probably why it’s called a velveteen plush blanket. There was no distortion on the sublimated printing, and the blanket was fairly inexpensive for a custom print. We charge $48.50 per blanket, less when you do a larger quantity. How do you show your pride for Wichita? Do you have a flag decal on your car or maybe a cool sign or table top? If you’re currently looking for a custom flag product, give us a shout. Whether it’s wall art, decals, or an actual flag, we can help you out. Prepping for trade shows can be stressful. It’s hard to put together a rockin’ display and find awesome swag, let alone mentally prep yourself to talk with people for hours on end! Think about the last time you went to an expo. Were you motivated to stop by the booths with a simple banner and no promotional items? Or were you drawn to the booths with a vibrant display and tons of freebies? That’s what we thought. 1) An eye-catching backdrop is probably the single most-important part of your display. Don’t overwhelm attendees by making your backdrop verbiage heavy. Go for your logo/business name, pertinent contact information, and maybe a few products or services you offer. Bonus points if you can use photos instead of words to show available products and/or services. The point of this product is to draw people to your booth and give them a brief idea of what your company has to offer. At Signs & Design we offer several backdrop options starting at just $170. 2) Additional signage like the retractable banners featured in this booth is the perfect way to provide more information to event attendees. Retractable banners aren’t your only option either. A-frame signs or a simple foamcore sign on an easel are more price-conscious options. The retractable banners are a great choice for those who frequently attend trade shows because they collapse down and come with a carrying case. A-frames can be bulky and difficult to transport without a larger vehicle. Foamcore signs are easily damaged if you aren’t careful with them; however they are great for one-time uses. 3) We love, love, love our full-dye sublimated tablecloths. They are full-color and can be machine washed and dried! They are less cumbersome to hang on a table than banners, and quite honestly, they’re not that much more expensive. A 6’ tablecloth runs $150, and the 8’ runs $180. An 8’ x 4’ banner costs $144. 4) While your tradeshow booth is a first impression of your business, the swag is leaves a lasting impression on your potential client. Statistically speaking, people like useful freebies the best. Tech comes in at a close second though. Stadium cups, pens, and bags are fairly popular items, but don’t limit yourself. We’ve got a database with over 800,000 promotional items. The sky’s the limit! One of our latest favorites is the Revablend. It’s this awesome blender bottle that literally has a blender blade at the bottom. We put the sample to use almost every day! 5) Setting up a TV or computer in your booth is a savvy choice for numerous reasons. First, it’s a great way to display more information (like photos or video) of your products and services. As a sign shop, this is something we utilize anytime we can. It’s not like we can bring in a storefront, semi, or monument sign. Thus, we use a laptop with a slideshow of our favorite jobs/products. Second, people don’t always want to talk to you. Sometimes they just want to grab their freebies, maybe watch a short clip about your company, and move on to the next booth. Not ideal, but hey, not everyone wants to listen to a spiel, no matter how friendly you are. Using a video or slideshow in this instance is a passive way of reaching out to more people. 6) Last, but certainly not least, we always recommend having seating. Standing in one place for eight hours or more is hard on your knees. We try to pad the floor of our exhibit with interlocking square cushions, but you still start to feel aches and pains after a few hours. Do yourself a favor and find chairs that blend in with your display (like the orange stools in Konexial’s booth). They offer your poor feet a reprieve throughout the event. Do you recommend any other vital trade show products? We’d love to hear your suggestions. If you’re in the market for new display materials, don’t hesitate to reach out. You can reach us by emailing ariel@signsdesignwichita.com or through Facebook.